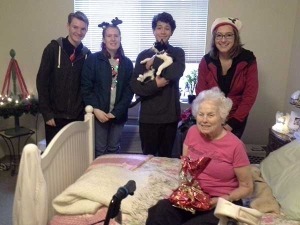 Faithful teens from Peace Lutheran Church teamed up with friends from area churches to visit homebound elders and bring them some Christmas cheer. Youth attending the most recent Teen Fling event assembled trays of cookies, sweet bread and other goodies, signed Christmas cards, and prayed over the gifts. Over the following days, they delivered 24 trays of goodies and sang carols to church members living in nursing homes and retirement centers, and visited elders still living at home. Teen Fling is an ecumenical group bringing together high schoolers and young adults from Lutheran, Methodist and Episcopal churches in western Nevada County. On the third Friday of each month, they gather for games and conversation, a meal, a service activity and worship. Young people are welcome regardless of where they are on their faith journey. A profession of Christian faith is not necessary to attend, and questions about faith encouraged. For more information, contact the church office at (530) 273-9631.